TVS Apache RR 310 price in Mumbai starts from Rs. 2.13 lakh (Ex-showroom). Apache RR 310 is available in only 1 variant. 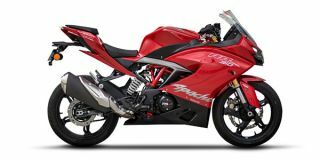 TVS Apache RR 310's top competitors are KTM RC 390 (price starting at Rs. 2.40 lakh in Mumbai) and Bajaj Dominar 400 (price starting at Rs. 1.63 lakh in Mumbai). Q. What is the service cost and all the spare parts are available? Q. What is the cost of 2nd service and will they change engine oil in 2nd service? They will change the engine Oil on Alternate service. So if you have got the Engine oil changed on the 1st service than it will be changed on the 3rd service. Q. What is the third service cost? Q. Suggest me between cbr250R and apache310. My use of bike is in the city and sometimes on highway and I want to know what are the average and maintenance cost of both?